When pumpkins and the apples start to ripen for the fall season, our Adventures begin on the Farm! We celebrate with more family fun and adventures than anywhere in Kentucky. There is unlimited access 7 days a week to Hayrides, Spooky FarmHouse, Sky High Slide, Bunnyville, Pumpkin Vine Zip Lines, Chutes and Slides, Culver's "Thank You Farmers" 5 Acre Corn Maze, Petting Zoo and much more. Follow this link to see events that are included in the General Admission tickets. 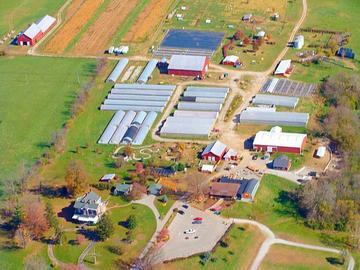 https://biwaterfarm.com/attractions/ Bi-Water Farm "Where Your Adventures Begin"
Any child 24 months and younger, does not require a ticket since they are FREE. Every person over 24 months old requires their own General Admission Season Pass. The General Admission season pass does not include AutumnFest Express, Paintball, Miniature Golf since these are extra charges and only open on Saturdays and Sundays, but can be purchased and added while at the farm.